Doubtless, you’ve heard that you should “Buy low and sell high”. Great theory, but how do you do it? Stock prices fluctuate. There’s no crystal ball telling you exactly when to buy. Since DRIPs make it feasible for you to invest small amounts on a regular basis, you reduce your risk of buying large chucks of shares at exactly the wrong time.You’re automatically buying more shares when the price is low and fewer shares when prices rise. That means you don’t need to pay much attention to market fluctuations, and you benefit from any temporary bargains that come along. 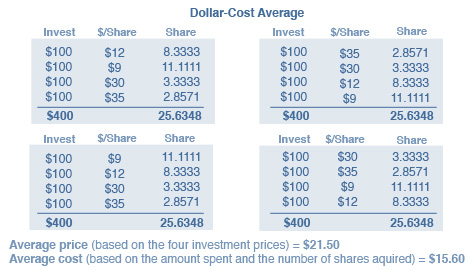 This is called “dollar cost averaging” and it’s a simple and reliable way to build greater wealth over time. Revered by billionaire investor, Warren Buffett, financial experts at Forbes, Barron’s and the top best-selling investment books, dollar cost averaging is one of the most successful long-term investing strategies. It makes saving for retirement easy because all that’s needed is a regular flow of a very small amount of money. And it helps you withstand the impulse to buy or sell with the crowd, which is how most investors limit their upside and generally lose money in the stock market. Using this strategy, your cost will be substantially less than the trading price of the shares during the period you are investing. That’s because you automatically buy more shares when the stock is selling at lower prices and fewer shares when it is selling at higher prices. Of course, this technique is only appropriate for those who invest with a long-term outlook (five years at a minimum). It will not produce results for traders looking for a fast buck. With DRIPs, you can put the strategy of dollar-cost averaging on auto-pilot. You simply invest a certain dollar amount on a regular basis. Result: You get more shares at lower prices and fewer shares at higher prices. Do this regularly with a no-fee DRIP and you will build wealth in the most cost-efficient way possible. These examples assume you invest $100 each quarter and buy however many shares your $100 will purchase at the current share price. Look what happens over time. The share price fluctuated between $9 and $35 so the average share price was $21.50. But your average cost per share was just $15.60. You’re buying more shares when the price is low and less shares when the price is high. That’s exactly how to buy low and sell high–the holy grail of investing success.